So, for anyone who inevitably says “tl;dr,” (that is, too long; didn’t read…and I don’t blame you if you do!) here’s the cliff notes version: I big puffy heart Cottonbabies customer service. 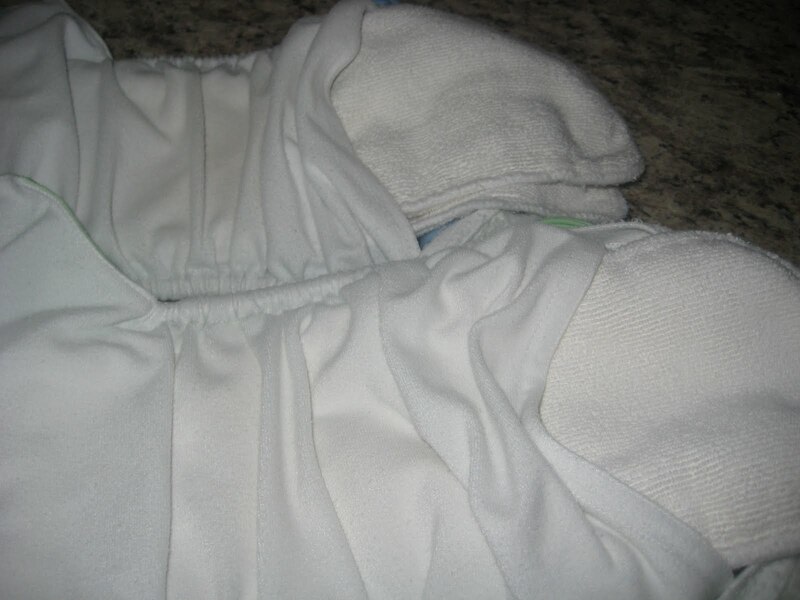 My first ever cloth diapers were Bumgenius 3.0s. I bought three in October 2009, and bought three more maybe a week or so later. Those 6 diapers have gotten a lot of use, since my strategy was to wash often, saving the money I would have spent on disposables. I used that money to build my stash gradually, and it was several months before I finally had enough to go to every other day washing! 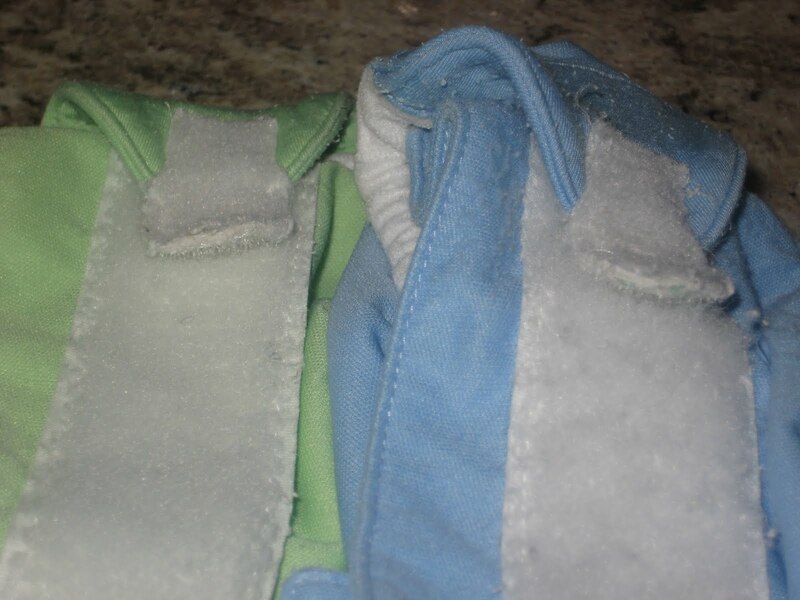 I knew from reviews that Bumgenius aplix didn’t last very long, but after a few months, my diapers started looking like this when they came out of the wash! These two saw the worst of it. The laundry tabs were pilly, one was rather shrunken, and the closure tabs were curled. I know that Cottonbabies sells refresher kits, but I don’t have a sewing machine. My Mom has an older one that she would let me use, but it’s kind of awful (sorry Mom!) and would probably make a mess of it. I was thinking I could just buy some white thread and try to do them by hand, but I figured it wouldn’t hurt to check first, to see if this would be covered under the 1 year warranty. I contacted Cottonbabies customer service on Monday, August 23rd and had a response the same day. To my surprise, it indeed would be covered under warranty. On the one hand, a product advertised to take your baby through potty training should last at least a year without needing “refreshing,” but on the other hand, it didn’t seem surprising to have aplix issues after nearly a year of lots of use. I was pleasantly surprised! I read on, and the other shoe dropped. The email said I would need to include info on how I cared for the diapers, including detergent. Dun dun dunnnnnn! We went back and forth for a few days, since the insinuation was that my warranty would be voided since I used detergents that were not “5 stars” on the “safe” list. Finally, on August 27th, I received word that it should be OK, and I could go ahead and send them in. I filled out an easy form online, received an RMA number, and packed the diapers up with a copy of my receipt, info about what was wrong with them, and included the RMA number inside and on the label. For the record, the RMA form did not ask me to include any info about how I cared for them. Cottonbabies requires that diapers sent back be clean and stink free, and I think mine were. They didn’t say whether or not I need to send along the inserts and doublers, so I went ahead and put them in. I sent them via USPS priority mail, printed online with delivery confirmation, at a cost of $5.05. I put them in the mail on Saturday, August 28th. I actually felt a little sad saying goodbye to these, since they are two of the three diapers that started me on my cloth diapering journey. Am I weird or what? On Monday, August 30th, I received an email saying that my exchange was processed, and that I’d be receiving another email when my replacement diapers shipped. #1, hello, that was fast! #2 how awesome that I was kept aware of every step! On Thursday, September 2nd, I received a shipping notice with a tracking number. 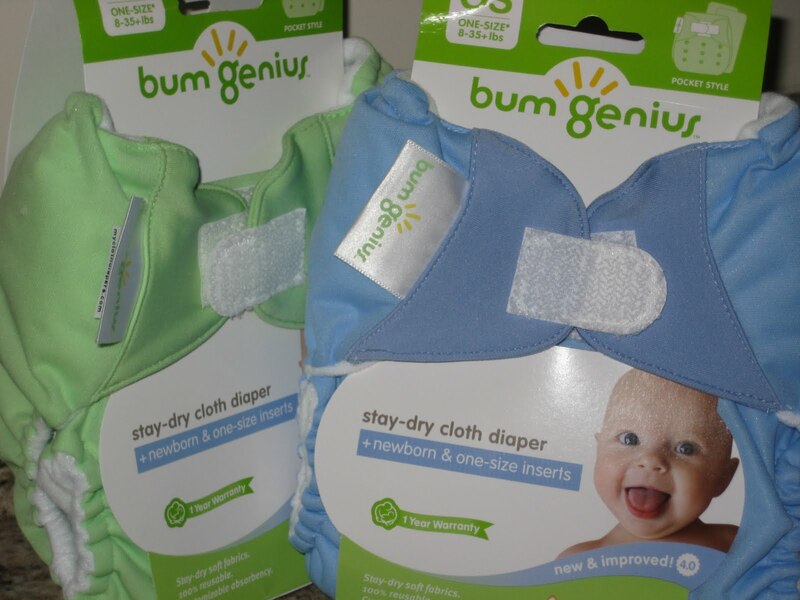 On Tuesday, September 7th, I received two brand new Bumgenius diapers in the mail!! They were in the next town over the weekend, so I know they would have been here even sooner if it weren’t for the holiday. The surprise was that they are 4.0 diapers! Yay!! So that means I probably won’t have any more problems with the aplix, though I assume replacement diapers don’t come with their own warranty. I am just beyond thrilled right now. Essentially for $5.05 I have two spanking new diapers, and got 10 1/2 months use out of the original diapers. Awesome, just awesome! Especially when I think about the trouble I had with my Blueberry aplix after only a month or so, and the “too bad for you” response I received when I contacted them! I have heard Bumgenius referred to as the “Wal Mart of Cloth Diapers” and while I do think they are a big name in cloth diapering, they didn’t get there with poor business practices. They make an awesome product; I have lots of favorites, but BG are still the ones my husband reaches for (past others) and they have just been all around great for us! This is just icing on the cake for me! 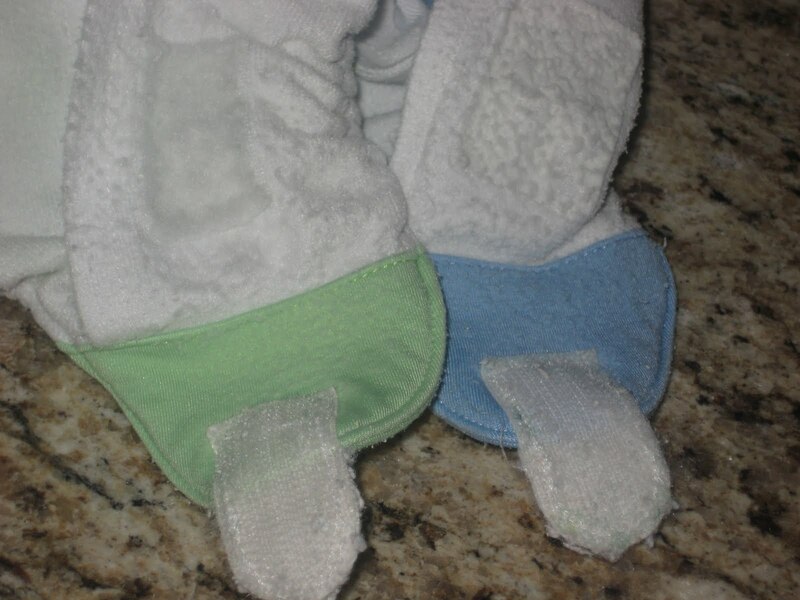 I assumed that any cloth diaper company would be quick to invalidate the warranty if they included velcro tabs. So I looked for the button type. I may reconsider after hearing this experience. Why Don’t I Give My Opinion in Diaper Reviews? Yes, curly tabs, they would stick but barely, and the laundry tabs were all shrunken! Amazing!! This is one of tge reasons I chose bum genius…the warranty. We had two in diapers at the time of purchase and I knew that we would definitely be getting or use, but the time has come, just as I thought it would, to replace. Good to know it will be so simple! >Customer service is a huge pet peeve of mine, and there's such a fine line there between trying to make money, and sending your business down the tubes.You can't "give the house away" but you need to make a good product at a good price, and stand behind it! By stand behind it I include taking responsibility for any errors and valuing the customer. (not just shrugging when your velcro fails after a month & saying lulz, that's just the way it is. Eesh. )I also find any comparison to Wal-Mart to be highly insulting, ha ha. Especially since I have found their prices to be higher than other places (especially if your store doubles coupons) and I've had quality issues with many of their items. I get a lot of my children's clothing at Gap, on clearance, for far less than wal mart brands. Yet any wal mart stuff we've received as gifts ends up stained and falling apart after a few washes! It doesn't fit my kids well, and then I have to deal with my daughter having a fit when it can't be fixed. >I had similar great experiences with Cotton Babies customer service. I had diapers die back when they made 2.0's and when they replaced them, I got some 2.0 and some 3.0 – I'm sure they were just transitioning their stock. But anyway – Great customer service! I think it is sad that such a great business is referred to as the "Wal-Mart of cloth diapers". Way to beat down a company that has done remarkable things in the reusable diaper industry. Just because a business is successful is no reason to bash them. I think their products are good quality, unlike cheap walmart.I think it speaks volumes about Cotton Babies that they make efforts to replace items that might really be on the edge of the warranty. It's not like they're trying to rip people off! >Jill, I am keeping a close eye on the other 4. They're not bad enough to be replaced yet.I hang my shells dry, except for a maybe 1 or 2 month period where I tossed them in on low for the last 20 min with the inserts.Mindy, are your refresher kits the new 4.0 style? From what I've read, you can sew the laundry tabs on right over the old ones, and snip the end of the closure tabs to make it easier to remove them/the stitching. I'm hoping my other 4 will be replaced as well, but I'm doubtful. Since I have a larger stash now, 2 are 2 of 4 night time diapers, and the other 2 are part of a fairly large rotation.I have an AIO I received free with the BG coupon, so I'm guessing that has no warranty. I'll have to replace those soon enough! >I was sent replacement tabs and I'm grateful, but such a hassle to need to replace these, especially since I'm not great at sewing. I'm not thrilled with the performance of my 3.0s over time and would recommend smartipants to someone looking for an affordable starter option. I've had the tabs for awhile now and just have to motivate myself to replace them. I stopped drying my covers a long time ago and feel like they should be in much better shape. My issue isn't with the customer service, but with the quality of the 3.0 itself. Oh, well. Live and learn. >man why couldnt this have happend a couple of weeks ago? my last 6 that hadnt been replaced went out of warranty at the end of august. had no idea they'd be replaced with 4.0s, or I would have done it. >Holy cow, that must be the twilight zone wal mart. I can't even begin to tell you about the Wal Marts here! >That IS great! I have had quite a few experiences lately with returning diapers. I had to return a tweedle bugs with shot elastic. Then I had to return the replacement for the same issue (actually they didn't make me return the replacement, they just sent me the shell so I didn't have to pay for shipping twice. I had to return a Fuzzibunz for delamination, and I also had to return a planet wise wetbag for unusually high amount of shrinkage (like it was a large and it is now just smaller thana medium. I've had great experiences with all of these companies and their customer service. In fact, I sent the info to fuzzibunz on a saturday morning, and they sent me the info on how to return it on that Saturday night!P.S. We have a really great wal-mart with excellent customer service. They have a rule – if a customer comes within a certain distance from an associate, they are to greet the customer and/or ask how they can help the customer. I don't always love going to all wal-marts, but ours is the exception to the rule. I am always telling managers about someone who gave me great customer service. >Cotton Babies has AWESOME customer service and although I don't know first hand I've heard absolutely great things about it. I'm so glad you got your diapers in just a couple weeks and that everything worked out. Hey for 10 months use on the first 2 and then $5 later you have new 4.0s that's awesome. And now you want to share a 4.0 with your favorite blogging friend right? 🙂 hehe!!! >That is so great! I am a little envious that you live close enough to go to the store. I've never been in a fluffy store! >I have seen other bloggers refer to Cotton Babies and Bum Genius as 'the Walmart of Cloth Diapers' and I think that it couldn't be further from the truth. When I walk into Walmart, I am rarely greeted and heaven forbid I need help getting something off the top shelf. Cotton Babies is the complete opposite! I love going to their retail store. I even had a saleswoman there play with my son while I made a decision on new diapers. They are so helpful both in person, over the phone, and through e-mail. I think they are truly passionate about their products and have made a name for themselves by having great business practices. Can't say enough great things about them!! !